The Warner Bros. logo and the title credits were surrounded by ominous dark clouds and lightning, transforming themselves into skull-like shapes in the sky - the Death Mark of Voldemort and the Death Eaters. The summer before Harry Potter's (Daniel Radcliffe) sixth year at Hogwarts School, Lord Voldemort's Death-Eaters (including criminal Fenrir Greyback (Dave Legeno)) were terrorizing London as speeding trails of black smoke. They spread havoc and chaos when they attacked the city, and after they entered into Diagon Alley, they kidnapped the wandmaker Mr. Ollivander. They also twisted and collapsed the Millennium Bridge - a pedestrian footbridge, and the death toll was rising from the catastrophe. Harry Potter had spent much of his summer in the underground riding on trains, and as the film opened, he was in a train-station cafe, reading the Daily Prophet's news about the imprisonment of Lucius Malfoy, one of the captured Death-Eaters from the previous film. The headlines read: "Azkaban's Newest Resident," and "Fallen From Grace - Malfoy's Wife and Son Leave the Trial." Albus Dumbledore (Michael Gambon) appeared to Harry in front of the underground station's billboard ad for perfume ('Tonight Make a Little Magic'), and escorted Harry - by apparating (teleporting) to a village where former Hogwarts teacher Professor Horace Slughorn (Jim Broadbent) was hiding out from the Death Eaters in a Muggle home, disguised in an arm chair. With Harry's presence to entice him (as his prospective "crowning jewel" in his collection of star students), Slughorn was persuaded to return to the school as Potions Professor. Harry was then unexpectedly apparated to the Weasley home (the Burrow), with his school trunk and owl Hedwig. He met up with Mrs. Molly Weasley (Julie Walters), her daughter Ginny Weasley (Bonnie Wright) - Harry's old girlfriend, and his two best friends: Muggle-born, bookish Hermione Granger (Emma Watson), and Ron Weasley (Rupert Grint), on their way to school for another year, but the entire group was reluctant and wary of returning to the school: "It was too dangerous" and "something bad's happening." 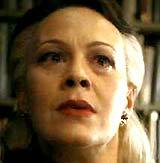 In a section of London, Malfoy's wife Narcissa "Cissy" Malfoy (Helen McCrory) and Bellatrix, Narcissa's older sister, conspired together with the deceptive, unpleasant Professor Severus Snape (Alan Rickman), who had been directly contacted by the Dark Lord. He assuringly agreed to help her tall, sneering blonde son Draco Malfoy (Tom Felton) with his deadly assignment [to kill Dumbledore] - the pact was sealed when Bellatrix manipulated Snape into making an Unbreakable Vow with Narcissa to "watch over Draco Malfoy as he attempts to fulfill the Dark Lord's wishes...and protect him from harm" - and if Draco should fail, Snape vowed to carry out the deed himself. While shopping in Diagon Alley (where half of the shops were closed down) at the new magic toy store of Ron's twin brothers, the trio of Ron, Harry and Hermione noticed Draco Malfoy and his mother Narcissa entering the nearby furniture shop of Borgin & Burke, where Draco was shown a large cabinet. They also secretly met with escaped, wanted Death-Eater criminal Fenrir Greyback in some kind of ceremony or initiation. In the next scene on the Express train to Hogwarts, Harry expressed his suspicions and fears to his friends about rival student Draco, now that his Death-Eater father had been imprisoned: "He's one of them (a Death-Eater)." 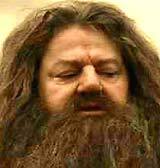 When the train arrived and was greeted at the station by Hogwarts' gameskeeper Rubeus Hagrid (Robbie Coltrane), Harry (using his Invisible Cloak) tried spying and eavesdropping on Malfoy, but he was discovered - and petrified with the command: "Petrificus Totalus" and then kicked in the face (causing a broken nose). 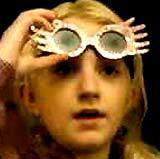 He was later rescued, unpetrified and healed by spacy, pale friend Luna Lovegood (Evanna Lynch) after she detected him with her SpectreSpecs. Greater security measures were evident at the school's grounds, guarded by Aurors, due to the threat of Death-Eaters entering the premises. During the school's opening dinner ceremonies in the Great Hall, the students were told about "troubled times" by Sorting Hat, and Headmaster Dumbledore introduced a new staff member, Horace Slughorn, who was resuming his old post as Potions Master. Meanwhile, the position of Defense Against the Dark Arts was filled by Severus Snape. Dumbledore described the reason for the new tighter security -- he told about a former student named Tom Riddle, now known as the Dark Lord, and then warned: "dark forces attempt to penetrate this castle's walls. But in the end, their greatest weapon is you." 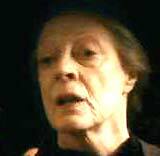 Assistant Headmistress Minerva McGonagall (Maggie Smith) encouraged Ron and Harry to attend Slughorn's Potions class. When they joined the class late, they had to borrow Advanced Potion-Making textbooks from the cupboard - and Harry discovered that he had an advantage while concocting potions -- his well-used, tattered book was annotated with corrections and short-cut improvements by its previous property owner, the mysterious Half Blood Prince! On the first day of class, Harry Potter was awarded one vial of a potion called Felix Felicis, or Liquid Luck ("One sip and you will find that all of your endeavors succeed") for brewing an acceptable Draught of Living Death, and he continued to excel in the class, even besting Hermione. Harry was privately summoned by Dumbledore to his chambers, to show him a large glass case of vials, one of which contained the Headmaster's memories regarding Tom Riddle, now known as "the most dangerous dark wizard of all time" - Voldemort. When the liquid from the vial was placed in Dumbledore's Pensieve, Harry saw the first day that Dumbledore met disturbed, 11 year-old Tom Riddle (Hero Fiennes-Tiffin) in Wool's Orphanage. The boy had already exhibited destructive magical powers buried deep within himself: "I can make bad things happen to people who are mean to me. I can make them hurt if I want." 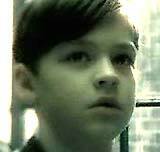 The delinquent boy was offered a place at Hogwarts, to teach him to use and control his magic abilities. [On the wall in the room was a picture of a rocky cliffside - a future clue to an important location.] 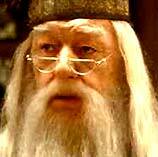 As Dumbledore left, Tom revealed: "I can speak to snakes, too. They find me. Whisper things." At Hogwarts, Tom Riddle became close to one of the teachers of the past, Professor Slughorn, who retained a memory critical to Voldemort's defeat, and Dumbledore instructed Harry to further confide himself closer to Slughorn to learn more. With Death Eaters threatening Hogwarts, Draco Malfoy visited (for the first time) the Room of Requirement on the 7th floor, a large warehouse packed with old clothing, furniture, discards, etc. Draco practiced magic there - placing a green apple in a large cabinet, one similar to the one from Borgin & Burke, to see if he could cause objects to vanish (and then reappear). Meanwhile, the Gryffindor students practiced for the Quidditch competitions, where Ron shone as the goalie-Keeper and attracted the fawning, romantic attentions of infatuated dippy classmate Lavender Brown (Jessie Cave). After getting a drink of Butterbeers at the local tavern named The Three Broomsticks, the trio of friends were walking back in the snow, when another student who was near them, Katie Bell (Georgina Leonidas), was carrying a necklace in a package (that she was given in the tavern to deliver to Dumbledore as a gift) - she fell down seriously injured, hexed and cursed with an Imperius Curse. [This was the first of two failed assassination attempts on Dumbledore's life.] Harry suspected that Malfoy was responsible for the curse, although Severus Snape defended his innocence, and mocked Harry's "Chosen One" status. Later, Harry's suspicions were confirmed when he overheard Snape mention how he had taken an "Unbreakable Vow" to protect Draco. 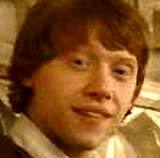 Before the Quidditch match, Ron - believing that he had been offered some of Harry's Liquid Luck to drink - and he played brilliantly. 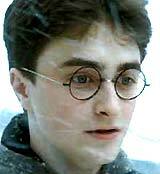 He became romantically involved with Lavender, snogging her repeatedly, causing heartbreak and jealousy for Hermione. She commiserated with Harry, who was also feeling distant from his ex-girlfriend Ginny Weasley - who was dating Dean Thomas (Alfie Enoch), although she would soon break up with him. During the Christmas holiday break, Harry stayed with the Weasleys at the Burrow, where he discussed recent events with two Order of the Phoenix members: he told a disbelieving Remus Lupin (David Thewlis) that Draco had been chosen by Voldemort for a mission, and that Draco was supported by Snape. In a discussion with Mr. Weasley, it was revealed that the cabinet was a vanishing cabinet that could be used for concealment - it was likely that Draco was planning to allow Death Eaters to be smuggled into Hogwarts through the cabinet (from the one at Borgin & Burke's, forming a passageway), with its power of transport. As Ginny and Harry were about to kiss on Christmas Eve night, Death-Eaters (Bellatrix and Fenrir Greyback) attacked the Burrow with balls of fire -- intending to kidnap Harry, but their plot failed when Remus and Nymphadora Tonks (Natalia Tena) came to provide support and held off the overwhelmed enemy. However, as the two Death-Eaters left, they set the Burrow on fire. Soon after, the Daily Prophet reported continued "Ministry Disappearances." 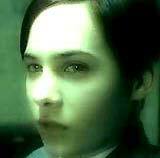 A second time, Harry viewed another memory in the Pensieve - this time 16 year-old Tom Riddle (Frank Dillane) was voicing a question to his understanding Professor Slughorn. He mentioned learning about a bit of restricted Dark Arts "rare magic" called... (indistinctly pronounced). Dumbledore called it his "most important" memory in his collection (it was crucial in their struggle to defeat Voldemort), although it was also a lie -- tampered with by Slughorn for some unknown reason so that one word was indecipherable. Harry was to find out what the true memory actually was - and immediately confronted his Professor with a direct question about the key memory. 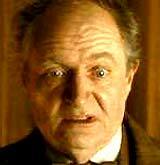 Slughorn sensed Potter's devious questions and refused to answer. In his room, Harry found that friend Ron had consumed candy (placed on Harry's bed in a box intended for him) with the love potion Amortentia put in it, by classmate Romilda Vane (Anna Shaffer), causing him to feel infatuated and obsessed with her. Harry brought Ron to Professor Slughorn for treatment. A remedy ("tonic for the nerves") was quickly mixed up. However, after Ron was given a second "pick-me-up" containing ingredients including "dazzling, oak-matured mead," he collapsed frothing at the mouth, but was saved when Harry used bezoar as an antidote. Cursed like Katie Bell had been, Slughorn was planning to give the entire bottle of mead to Dumbledore as a gift, not realizing that the mead had lethal poison mixed in with it, and it would have killed the Headmaster. [This was the second attempt on Dumbledore's life.] Ron was treated in the Hogwarts medical hospital, where he lay semi-comatose - and in that state mumbled Hermione's name within earshot of Lavender, who burst out sobbing and ran from the room. Harry continued to follow Draco around the school, to determine his suspicious motivations. Draco had often visited the vanishing cabinet within the Room of Requirement, practicing with a white bird to be sent through to the second cabinet at Borgin & Burke, although the cabinet malfunctioned and the bird returned dead after transport. Soon after in the upstairs boys' toilets room, Harry confronted Draco, whom he suspected cursed Katie Bell, and they hurled curses at each other. Harry connected with a curse from the Half-Blood Prince's book designed for enemies - Sectumsempra - severely harming and wounding Draco. Snape appeared and healed Draco with another command - Vulnera Sanentur - to fulfill his vow to protect Draco, while Harry retreated from the flooded room. To rid themselves of the Potion book of 'dark magic' before any further damage or use, Ginny decided to lead Harry to the Room of Requirement where it could be hidden, and while Harry's eyes were closed to prevent temptation, she kissed him. They also came upon the vanishing cabinet, but thought nothing of it. Harry then drank his vial of Felix Felicis to help him retrieve Slughorn's tampered-with memory - he coaxed the Professor, known for tippling, to join him for an off-campus visit at Hagrid's. After viewing and giving a funeral-memorial to the corpse of Hagrid's "oldest friend" spider Aragog -- a venomous Acromantula, Slughorn and Hagrid became intoxicated in his hut. Harry confessed he was "the Chosen One" and survived death from Voldemort when his mother Lily sacrificed herself for him. He pleaded with Slughorn to be brave like his mother and reveal his true memory: "Only I can destroy him, but in order to do so, I need to know what Tom Riddle asked you all those years ago in your office and I need to know what you told him." Slughorn passed his memory over to Harry on the tip of his wand, and it was taken in a vial to the Pensieve, where Harry viewed it with Dumbledore. The missing word spoken by Tom Riddle was "Horcrux" -- a "very dark," powerful magical object that ensured immortality. A Horcrux was an object that concealed and stored part of the creator's split soul: "By doing so, you're protected should you be attacked and your body destroyed...That part of your soul that is hidden lives on. In other words, you cannot die." The way to split one's soul was to commit murder: "Killing rips the soul apart. It is a violation against nature." Tom Riddle revealed he had splintered his soul into six fragments or pieces attached to Horcruxes, while leaving a seventh piece in his body. Dumbledore surmised that the Horcruxes were commonplace objects -- the ring of Voldemort's maternal grandfather Marvolo Gaunt (destroyed by Dumbledore during the summer before the school year), and Tom Riddle's diary (destroyed in the conclusion of Harry Potter and The Chamber of Secrets (2002)), two of Voldemort's Horcrux objects, had already been destroyed. If all of the Horcruxes were destroyed, "one destroys Voldemort." Dumbledore, on task to track down and destroy the Horcruxes, believed that he had located a third Horcrux, and needed Harry's assistance to destroy it. Dumbledore and Harry apparated from Hogwarts' Astronomy Tower to an "extremely dangerous" location - a rocky seaside cliff - where the Headmaster commanded that Harry obey every one of his commands without question. Inside a rock cave they found a crystalline island. Dumbledore commanded Harry to watch over him - and ensure that he completely drank a mind-altering potion that hid the Horcrux. When Dumbledore finished the potion, a small pendant-locket (once owned by Salazar Slytherin) was revealed. However, they were attacked by a crawling horde of dead, gray-colored, slow-moving, waterlogged and zombie-like inferi, emerging from the water as guards of Voldemort's Horcrux and threatening to drown Harry. Although weakened, Dumbledore repelled them with swirling flames of fire and the command: Partis Temporus, before apparating the two of them back to the Astronomy Tower. Meanwhile, Bellatrix, Fenrir, and other Death Eaters emerged from the repaired cabinet in the Room of Requirement within Hogwarts. Dumbledore instructed Harry to summon Severus Snape, but when footsteps were heard, told Harry to hide and remain quiet on the floor below. When Draco appeared, the headmaster accused the shuddering and fearful student of being an ineffectual assassin who was also behind the two weak attacks on Hogwarts students (Katie Bell and Ron Weasley) - both aborted attempts on Dumbledore's life: "Your heart can't really have been in them." 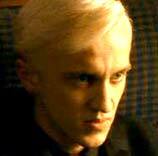 As Draco insisted that he was chosen by Voldemort to kill Dumbledore ("He trusts me. I was chosen"), and that he must fulfill his deadly mission, the group of Death Eaters joined him. As they urged Draco to murder Dumbledore, he hesitated to perform the deed. Snape arrived on Harry's level, and motioned for Harry to remain quiet as he joined the Death Eaters on the upper level. 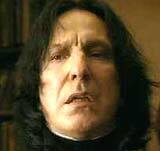 Snape cast the Avada Kedavra Killing curse against Dumbledore, who fell dead off the tower - a shocking murder! The group of Death Eaters, joined by Snape, fled from Hogwarts, as Bellatrix cast the Death Mark in the sky over the school. The Great Hall was destroyed, and Hagrid's Hut was set on fire. 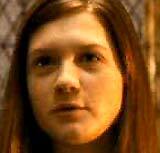 Harry pursued them, and cast an Incarcerous spell at Snape, although it was deflected. 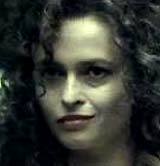 After being stunned by Bellatrix, Harry further cast the Sectumsempra spell at Snape, but was again fended off. Snape admitted why it didn't work - he was the Half-Blood Prince and the creator of the spell ("You dare use my own spells against me, Potter?"). At Hogwarts, the entire student body and staff mourned and grieved over Dumbledore's death, and Harry was personally comforted by Ginny. They all raised their wands to repel the Death Mark in the clouds above them. To the Dark Lord. I know I will be dead long before you read this, but I want you to know it was I who discovered your secret. I have stolen the real Horcrux and intend to destroy it as soon as I can. I face death in the hope that when you meet your match, you will be mortal once more. It was left by someone with the initials "R.A.B." [Did it signify Regulus Arcturus Black (initials RAB), Sirius' younger brother, a Death Eater killed by Voldemort?] Harry was disheartened, declaring everything a "waste." He told Hermione that he wasn't intending on returning to school the next year, but was planning on locating R.A.B. and hunting for the remaining Horcruxes by himself: "I've got to finish whatever Dumbledore started." 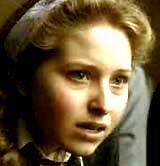 She pledged that she and Ron would support and help him: "You need us, Harry." They watched as Dumbledore's sacred firebird-phoenix, named Fawkes, flew toward the horizon. This was the sixth film in the long-running series-franchise. There were seven J.K. Rowling books, but eight films - the last book would be split into two films. 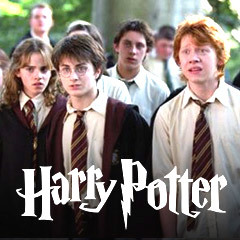 This film marked the last time that the main characters were academic students during a school year at Hogwarts. With a production budget of $250 million, and gross revenue of $302 million (domestic) and $929 million (worldwide), one of the highest grossing films of all-time. With one Academy Award nomination (no win): Best Cinematography. Key Scenes: Snape's apparent act of treachery in the shocking killing of Headmaster Dumbledore, and the earlier revelation that Snape was the mysterious Half-Blood Prince of the film's title, who had scribbled helpful shortcut annotations in the margins of Harry's old Potions textbook. David Yates had also directed the previous film, Harry Potter and the Order of the Phoenix (2007). The closing episodes, also to be directed by Yates -- Part 1 of Harry Potter and the Deathly Hallows would be released in 2010, Part 2 in 2011.